The fact that this is my seventh muffin recipe on the blog shows how much I love them. I'm certainly not the first to proclaim the muffin top to be the best part. When the muffins are not intended for any occasion the following day, there can be half a dozen mangled muffin bodies after Steven and I are through with them. The tops are best after the muffins have rested for a few minutes after coming out of the oven. This crucial wait allows for the exterior to set into a slightly crunchy crust and allows for the muffin to cool enough for eager fingers to pry the tops off of the unsuspecting body. We can't let the precious tops go to waste. After muffins sit around, you lose the distinction between the top and bottom and the next day, you're left with a plain, uniform muffin. The tops are never the same, even after reheating them in the oven. I wondered why I’ve never seen a pan that capitalizes on muffin-top love like game changing edge brownie pan. But a quick google search proved me wrong! In fact, Chicago Metallic deemed themselves the creator of the Original Muffin Top Pan . While the idea is brilliant, I’m not for paying $15 for a pan that only makes 6 muffin tops when my current muffin pan that was a fraction of the cost works just fine. For similiar reasons, I never purchased the $30 (highway robbery for a student in debt) brownie pan when I can still bake them in my $5 pyrex. But with a little more digging, I unearthed a similar shallow "whoopie pie pan" that looks like it will make the same end product. The ridged edge along the rim of the pan will make it a little more difficult to wash than the Chicago metallic but it’s cheaper and bakes twice as many muffins. This one is going on the registry. Now back to the actual muffin. Four years of blogging and I have finally made the quintessial blueberry muffin. My past recipes have used sour cream or a combination of sour cream and buttermilk. But years of baking have led me to refine my original recipes (which are still good by the way). I’ve found that batter made with sour cream alone is very thick and a little difficult to work with. Batter made with plain milk becomes a good consistency but the finished product lacks in flavor. Buttermilk muffins have the same subtle tang and delicate crumb of sour cream muffins but the batter is easier to work with. When it comes to the fat in the recipe, butter offers the best flavor hands down, but adding a little bit of a neutral oil creates a moister product when eaten at room temperature. As for the berries, it’s best to use frozen or fresh blueberries. I think canned berries have an odd, sometimes metallic flavor, and their squishiness does not stand up well to being mixed into batter. Lastly, a note about baking. I've been baking my muffins at 400 degrees for years now. After experimenting with a different recipe at various temperatures, I found that the higher temperature gave them a handsome golden brown crust. Now I discover that higher temperature also contributes to the coveted domed top. How serendipitious! Preheat the oven to 400 degrees F. Butter or spray a muffin tin with nonstick spray. If you are using paper liners, lightly spray them with some oil so less muffin sticks to them when they're being peeled. In another bowl, whisk together the melted butter, oil, egg, and sugars. Then whisk in the buttermilk and vanilla. Pour the wet ingredients into the dry ingredients and fold the two sets of ingredients together. Scoop a mounded 1/4 of batter into each muffin tin, making sure the batter is distributed evenly amongst the 12 tins. Bake at 400 degrees F until a toothpick inserted in the middle of a muffin in the center of the pan comes out clean, about 15 - 17 minutes. But like the article linked earlier in the post says, if your muffins are looking too "peaked" and scraggly for your tastes, try baking them at 375 for 17 - 20 minutes. Every oven is different. There ARE muffin top pans, I haven't tried them though. I man I wish I had some blueberries in the house RIGHT NOW! i just made a bunch of blueberry muffins. Junior's copycats! yours look great. 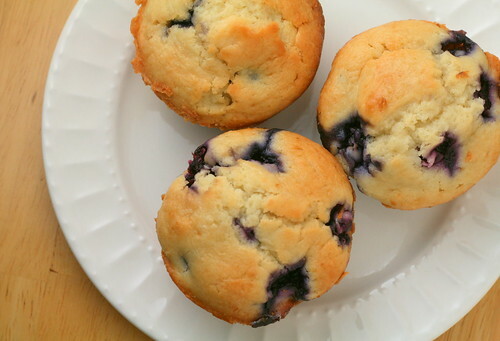 I've been looking for a good blueberry muffin recipe for a while now. These look delicious! They came out great. Nick loves them! Thanks for the recipe. I have never seen a brownie pan like that! I will have to try one because they are my favorite.